1040x 2016 is not the form you're looking for?Search for another form here. 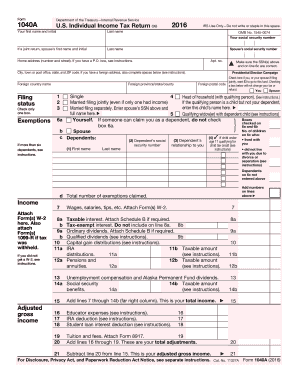 Who needs a 1040x 2016 form? This form is used by the taxpayers to correct the information in forms 1040, 1040A, 1040EZ, 1040NR and 1040 NR-EZ. What is the purpose of the 1040x 2016 form? The Amended US Individual Income Tax Return is required to make the amendments and corrections to the individual income tax return forms. The IRS uses the information to make corrections in the database. The taxpayer can make the following changes: return filing status, income and deductions, number of exemptions, etc. 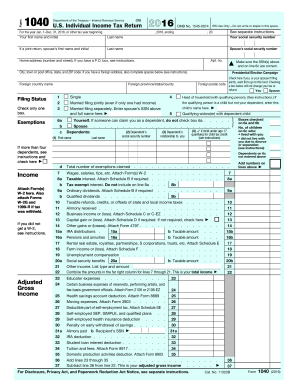 What other documents must accompany the 1040x 2016 form? Depending on the reason of changes to the individual income tax return form, the taxpayer should attach other supporting documents. Keep in mind that changes in your return may need to adjust other items. When is the 1040x 2016 form due? This form should be filed after the taxpayer has filed the original return. As a rule, this form must be filed within two years after paying the tax. This date may be changed though for people who were mentally or physically unable to complete the form. What information should be provided in the 1040x 2016 form? The form should be signed and dated by the taxpayer and preparer (if other than the taxpayer) and the spouse (if applicable). 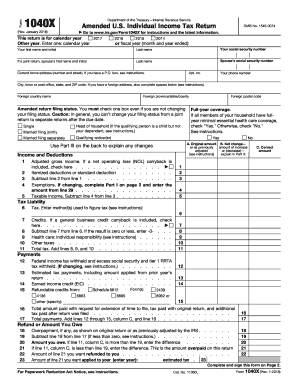 What do I do with the 1040x 2016 form after its completion? The signed Amended Tax Return and all the supporting documents are forwarded to the Department of the Treasury, Internal Revenue Service, Austin, Texas.